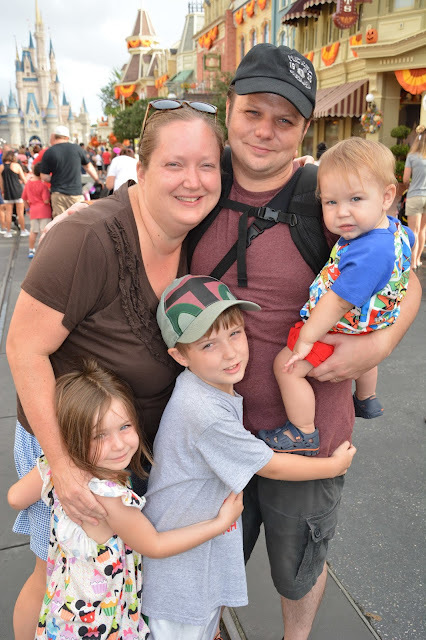 Our second day at Disney was spent at Magic Kingdom. The park opening has changed since we were there last, and you can actually get into the park, up Main Street and to the castle before it actually opens now. Since we didn't do a character breakfast super early we got there not too long before it opened and waited what felt like forever to have a family photo taken in front of the castle. As we started walking closer, we realized that the lines were much shorter the closer you get, so we kept that in mind for when we went to Mickey's Not So Scary Halloween Party later in the week. I personally loved seeing Main Street all decked out in Halloween and fall decorations. I'm not entirely sure of the order of what we did things, but I think the kids rode the carousel first, then we went and saw Mickey's PhilharMagic before riding It's a Small World. We had a fast pass for Peter Pan's Flight since we never rode it the last time because the line was always crazy. It was ok, but there are so many other rides I'd rather wait in line for. 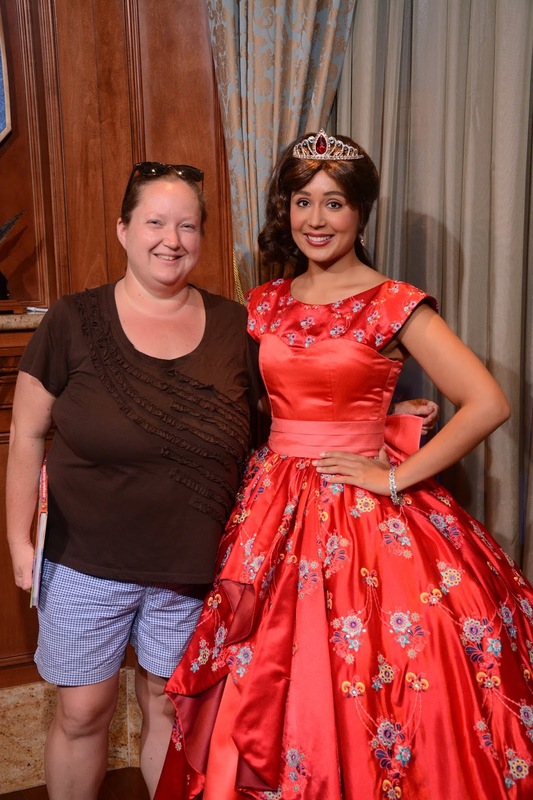 We had another fast pass to meet Cinderella and Elena of Avalor since we didn't get to meet Cinderella last time - I was the only one who would talk to Elena - I felt so bad because Cecily wanted nothing to do with her and only wanted to see Cinderella. Our next fast pass was for Dumbo and as we made our way over to it, we saw that the line for Journey of the Little Mermaid wasn't very long, so Ewan, Cecily and I rode it. When we got to Dumbo, the line for the Barnstormer wasn't long at all, so Alan rode it with the big kids while I fed Cameron before riding Dumbo. I think after that we grabbed lunch then went and got our spot for the parade. I waited with Cameron while Alan and the kids browsed the shops on Main Street. After the parade, we headed over to Tomorrowland and the kids met Stitch. Cecily loves him and we didn't tell her she could meet him so she was super excited. 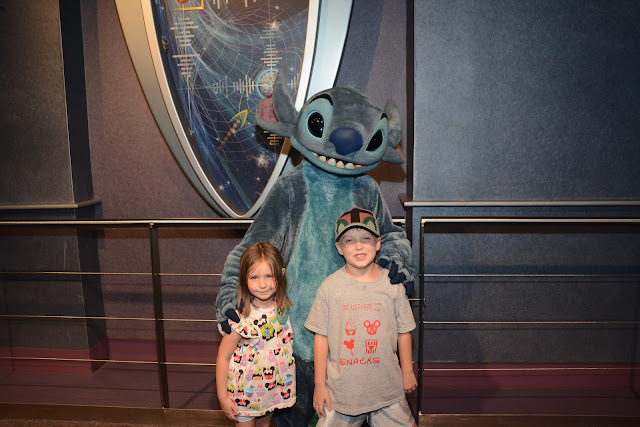 The kids rode the Astro Orbiter and we all rode the People Mover before Alan and I took turns staying with Cameron while we used a fast pass for Buzz Lightyear's Ranger Spin. After Cecily and I finished, those lovely rain bands from Hurricane Michael were coming through and it started pouring. So, we hung out under an overhang for a bit until it died down a little. Alan got the kids a fast pass for the teacups so he rode it with them while I waited with Cameron. I get horrible motion sickness so there was no way I was getting on that ride! Since MNSHP was that night, we had to be out of the park by 6, but we saw that the line for Haunted Mansion wasn't too long so we decided to ride it before leaving. As we were walking over there, the sky kept getting darker and darker and right as we parked the stroller the sky opened up again. Luckily, we had umbrellas and were able to wait almost the entire time under the covered portion of the line. We didn't ride it the last time we were there and I was sure that we never did when we went in 2010 as part of the Higgins Family Vacation. But, once we got on the ride, I realized that we actually had been on it. All the parks were somewhat crowded because of all the fall breaks going on at the time, but we still got to do a ton of stuff. I know a lot of people go to the Halloween party after spending all day at Magic Kingdom, but since you can just go at 4PM with your MNSHP ticket, we did that on another day. So, stay tuned for more of our trip!